Are you tired of toiling near the bottom of the CPU performance food chain? We are! Let us introduce the 1Ghz Thunderbird Athlon processor from AMD. The 1GHz Thunderbird Athlon has been widely available in North America for a while now at fairly low prices. A quick scan on Pricewatch shows that AMD provides an incredible price advantage over Intel's PIII-1.0GHz counterparts. While an Intel Pentium III 1GHz will burn a hole in your pocket at $435 USD / $657 CDN, an AMD 1Ghz Athlon will only cost you a paltry $171 USD / $258 CDN. A $400CDN difference in price is something to take note of, especially if you're in the market for a new system! As a quick overview, the Thunderbird series of Athlon CPU's represents AMD's answer to the 1:1 core to cache speed ratio which Pentium III Coppermine have had for quite some time now. I can recall when the Pentium III Katmai (512K cache half speed cache) CPU's were getting beaten around by the old Slot A Athlons (with 512K variable speed cache). Intel answered this challenge with their 256KB 1:1 core to cache speed Pentium III's. Those processors were able to outpace the current Athlons at the time because of the 256KB of L2 cache. That cache on those newer Pentium III chips allowed Intel to take the performance lead over the Athlon, at least for a while anyway's. Now we are at a time when the Pentium III and Athlon are fighting on a more even ground (in regards to L2 cache speed and size). Unfortunately for Intel and the Pentium III, the Athlon does have some other obvious advantages (aside from price). That fact that the Pentium III only has 32KB of L1 cache and the Athlon has 128KB, coupled with the fact that the Athlon has a faster and more advanced floating point unit, utilizes a more bandwidth pleasing 100 Mhz DDR bus equates to lead which has so far proven difficult for the Pentium III to keep up with. Also, Pentium III's are realistically topping out at 933Mhz mostly because the 1.0GHz models are still relatively hard to find. If you can find one, expect to pay significantly more than the AMD equivalent. The AMD Athlon processor is among the world's most powerful engines for PC computing, and represents the industry's first seventh-generation x86 microarchitecture. The AMD Athlon processor family is designed to power the next generation in x86 computing platforms. It meets the computation-intensive requirements of cutting-edge software applications running on high-end desktop systems, workstations, and servers. All AMD Athlon processors are now produced using 0.18-micron process technology. The AMD Athlon processor provides exceptional processing power on real-world, mainstream Microsoftr Windowsr compatible software, as well as computation-intensive applications for high-end desktops. These high-end workstation applications include digital photo editing, digital video, commercial 3D modeling, image compression, soft DVD, CAD, and speech recognition . Microarchitecture: The AMD Athlon processor features a superpipelined, nine-issue superscalar microarchitecture optimized for high clock frequencies. The AMD Athlon processor contains a total of nine execution pipelines: three for address calculations, three for integer calculations, and three for executing x87 (floating point), 3DNow!"! and MMX"! instructions. System Bus:The AMD Athlon processor's system bus is the first> x86 platform bus running at or above 200MHz. 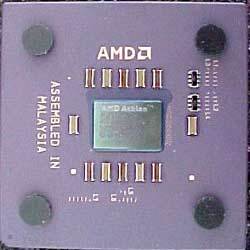 At present, AMD Athlon processors are available with 266MHz and 200MHz system buses. As one of the fastest x86 processor buses currently available, the design delivers as high as 100 percent more peak bandwidth than any x86 system bus. It is designed for scalable multiprocessing and leverages high-performance Alpha"! EV6 bus technology to enable exceptional system performance. Floating Point Engine: The AMD Athlon processor includes the first fully pipelined, superscalar floating point engine for x86 platforms. The resulting floating point capability is the most powerful ever delivered in an x86 processor. Enhanced 3DNow!"! Technology: The AMD Athlon processor's enhanced 3DNow! technology takes 3D multimedia performance to incredible heights and builds on the 21 instructions of AMD's original 3DNow! technology-the first x86 instruction set to use superscalar SIMD floating point techniques. Enhanced 3DNow! technology adds 24 instructions-19 to improve MMX integer math calculations and enhance data movement for Internet streaming applications and 5 DSP extensions for soft modem, soft ADSL, Dolby Digital, and MP3 applications. Cache Architecture: The AMD Athlon processor boasts a 384K total full-speed on-chip system cache including 128K L1 cache--four times that of Intel's Pentiumr III processor--and 256K on-chip full-speed L2 cache. This performance-enhancing cache design helps boost overall system performance. All of the background information is interesting, but benchmarks are more useful, and much more fun! !